So you are going off to choose your black Labrador Retriever puppy. Picking your new pet is always a thrill and soon you will be taking that bouncing fur ball of fluff home with you and embarking on a great lifelong adventure together. The bad news is that you are about to make one of the most difficult decisions ever. ‘Just which one of all these lovely puppies is the best one for me?’ Or, to put it another way ‘Which of these adorable dogs do i leave behind?’ Believe me – it isn’t easy! So how do you go about choosing the right puppy? There are lots of different opinions but there are some obvious things to consider first. The main thing is to make sure the puppy is healthy and although the chances are that you aren’t a vet there are a few things to look out for. Have a look at the puppies eyes. They should be clean and bright. Gunge or discharge from the eyes is never a good sign. Similarly, make sure the ears are clean on the inside and that there is no discharge. Inspect the puppies coat and make sure it is lovely and soft. Bald patches could be a sign of infection and make sure there are no spots and bumps that would indicate the presence of fleas or ticks. 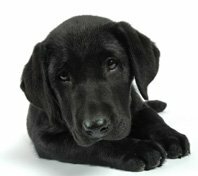 Beyond those basic guidelines the choice of which black Labrador Retriever puppy you choose will probably come down to instinct and the chemistry you enjoy with the dog. If a puppy is drawn to you he will let you know and if he has loads of energy, curious and interested in you then you probably have a winner! But, at the same time, be prepared to be make hard decisions. If a tail wagging puppy wants to adopt you, but you notice weeping from the eyes or signs of infection, steel yourself and say no. Make sure the puppy you choose is healthy as well as full of fun. It will be the right choice in the long run. A good place to start is to search for a reputable breeder on the AKC Labrador Club website. Before visiting the breeder prepare a list of questions and be prepared to be asked questions. A quality breeder will make sure that one of their pups is going to a good home. What is the genetic and health history of the parents? Has the breeder participated in any Labrador dog shows? Have they participated in any conformation classes (the quality of the breed is evaluated in these classes)? Are there any health guarantees? Were the pups touched and handled in order to introduce them to their environment and being with people? Asking the breeder questions shows that you care so don't be shy. As about the temperament of the parents and the personality of the puppy.